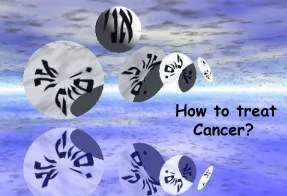 In spite of the outstanding technological innovations applied in treatment, cancer is generally incurable. It is assumed that cancer starts from a genetic aberration that turns a cell into a parasite encroaching on a passive host until his destruction. Nothing can save the patient from his destiny except early removal of the parasite. While in other diseases the organism continually attempts to improve its condition, in cancer it seems to be passive and helpless. Yet this may not be so. The organism may not be so defenseless as it appears. Its apparent indolence might reflect our ignorance. In the past, the organism was thought to resist cancer with the immune system. Since no tumor specific antigen has been found, immunity is of no avail. Today no other defensive mechanism in cancer is proposed. Yet in order to understand a disease we ought to distinguish between its triggering factor, the noxa, and host response (1). In cancer, host response is not accounted for. However, cancer is not the only disease in a passive organism. Arteriosclerosis also evolves in a seemingly helpless body driving it from myocardial infarction to cerebral vascular event. By regarding the organism helpless, modern medicine actually ignores an important facet of cancer treatment that was unearthed by Canguilhem, and called Normativity (2,3). The organism operates optimally in health and in disease, and the optimal state that it maintains under the circumstances is its norm (2,3). Homeostasis, for instance, is a manifestation of this norm. Since capable of creating its norm, the organism is normative. "Normative in the fullest sense of the word," says Canguilhem, "is that which establishes norms." (2-p.127, 3). Cannon called this characteristic "Wisdom of the Body" (4). Unlike a chemical reaction that settles at its equilibrium passively, the organism creates its norm actively, since being normative. A good norm should tolerate, or resist, arbitrary environmental variations. The greater the tolerance the better the norm. At any instant, Normativity creates the norm with highest tolerance under the circumstances. Normativity stands for the active role of the organism in disease, and is the main concern of Normative medicine that differs from modern medicine by its definition of disease. According to modern medicine disease is regarded as deviation from health, or a lost health. Normative medicine, on the other hand, does not define disease in an absolute sense. It leaves the definition to the organism, or the patient himself. For instance, according to modern medicine a patient with a healed myocardial infarction is healthy since his heart condition was restored. Normative medicine regards the healed heart as a new norm with reduced tolerance. When the patient feels well this norm represents health, whereas if complaining, it is a disease. Normative medicine is more concerned with the decline of tolerance than with the disease itself. "The sick man is not abnormal because the absence of a norm but because of his incapacity to be normative. ", says Goldstein (2, p.188). "Disease is not merely the disappearance of physiological order but the appearance of a new vital order" (2, p.193). "Disease is not a variation on the dimension of health; it is a new dimension of life." (2, p. 186). While modern medicine strives to restore norms, normative medicine attempts to maximize tolerance. In his important treatise "The Normal and the Pathological", Canguilhem laid the foundation for a holistic, or normative medicine (2,3). All phenomena in the organism, even if appearing as localized are essentially systemic. The organism actively maintains an equilibrium, or norm whose quality is expressed by its tolerance to environmental variability, or noxa. The organism proceeds irreversibly from one norm to another, when Normativity selects the norm with the highest tolerance. The treatment objective of modern medicine is to restore a lost state, while normative medicine attempts to establish a new norm with the best tolerance under the circumstances. When treating a patient with insulin we aim at lowering blood glucose to its non-diabetic level. This however does not cure diabetes. Insulin treatment repairs only one aspect of the disease and will never restore the patient's original health. Diabetes changes the entire organism that creates a new norm. While modern medicine regards this change as passive adaptation to insulin deficiency, normative medicine regards it a new dimension of health that ought to be considered during treatment. The correction of blood glucose to its non-diabetic level may not be optimal to the new norm adopted by the organism in diabetes. The correct insulin dose should be normative to the entire organism and not just to blood glucose. We shall call it "normative insulin dose". Under the circumstances a mild hyper-glycemia might be preferable to a non diabetic blood sugar level since being closest to the patient's norm. The correct treatment may be judged only by its effect on tolerance, which is generally ignored by modern medicine. Oncology views cancer as a gradual deterioration of a passive organism, while to normative medicine cancer is a creative endeavor. An innovative experience in the living being and not just a fact of decrease. The primary problem of cancer is not its changing norms, e.g., the tumor, but declining tolerance. The tumor is obviously one component in a systemic disease in the same way as insulin in diabetes (5). Cancer treatment should be normative to the entire organism and not just to the tumor. The question to be asked is whether tumor removal boosts or lowers tolerance. Normative treatment requires "interrogating the organism, or its wisdom" in order to assess when and how to treat cancer. It is striking that most tumors grow unnoticed. While in non cancerous diseases pain and malfunction drive the patient to seek help, a small tumor does not cause pain. This might be the main message of the organism with a localized tumor. "I feel well, therefore do not touch me!". Modern medicine disregards this advice since coming from a "stupid", or at best, helpless organism. Although the tumor is the most conspicuous cancer manifestation, it is only one component in the cancer norm. Its removal has to gauged by the effect on tolerance. Apparently a symptomless tumor may be left intact. It should be treated only when causing pain or undermining a vital function. Even then, the amount that is removed has to be gauged by its effect on tolerance. Cancer is a systemic disease manifested by three ingredients, neoplasia, paraneoplasia, and cachexia. While oncology postulates that the tumor causes the other two, cancer might be first of all a pernicious cachexia, manifested among other by a tumor (6,7). Tolerance can be estimated by interrogating the "Wisdom of the body", which may seem strange to a modern physician yet was the main concern of our forefathers. Hippocrates called it prognosis. With time, medicine adopted rules of thumb for estimating tolerance, e.g., the behavior of a fever, or the patient's appetite. Tolerance can be estimated by non-verbal communication, or from the body image. It may be estimated also from the growing tumor itself. Since the tumor is a component of an equilibrium that makes the norm, its growth rate is inversely proportional to tolerance. If for instance, tumor removal is followed by accelerated metastatic spread, treatment was obviously detrimental to tolerance. Resistance to chemotherapy that is generally attributed to the tumor actually reflects a declining tolerance induced by previous treatment. "Maximize tolerance! ", that should be the guiding principle of treatment, is unfortunately ignored by modern medicine. 1	Zajicek G. What is disease? Cancer J. 4:296,1991. 2	Canguilhem G. Le normal et le pathologique. translated into English by Fawcett CR, Cohen RS. Zone Books New York 1991. 3	Zajicek, G. The Normal and the Pathological. Cancer J. 7: 48-49,1994. 5	Zajicek G. Cancer starts as a systemic disease. Cancer J. 3:128,1992.